Roger purchased a lathe and began doing some wood turning shortly after retiring. He uses what he calls the “leftovers” – the knobby, knurly and highly figured hardwoods. With these pieces, Roger began creating beautiful and functional items from boxelder, black walnut, hickory and other local hardwoods. 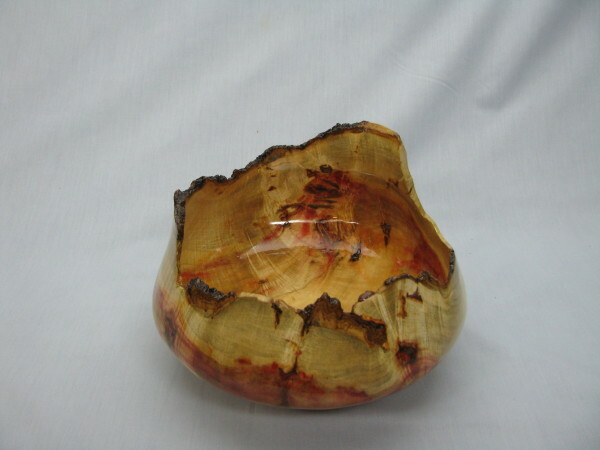 Trimmings, crotch pieces and wood considered to be “waste” by local timber harvesters has become the source for bowls, specialty tables and other artistic creations. What began as a hobby has turned into a business. Roger is actively selling his works in a number of galleries located throughout the region. Roger states wood is always unpredictable; every piece being different. Unlike other mediums where the artist decides what to use and how to create, the wood dictates much of what will be done and the artist is left to create within those boundaries. His personal challenge is to make something unique and new – something nobody else has made before – and to Roger this challenge is wonderful and addictive.